"The choice is not between the Court and the State, but instead whether the individual can decide who to marry, or whether the government will decide for him." 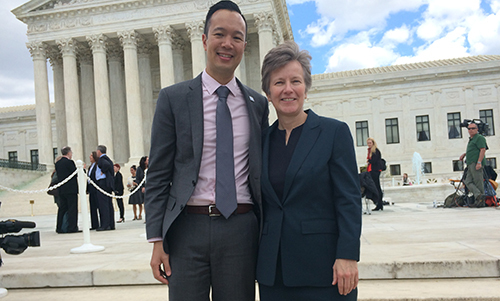 Today I had the honor of watching Mary Bonauto make the case for the freedom to marry to the nine U.S. Supreme Court justices. The anticipation right before argument was palpable, and the room was packed with a veritable ‘who’s who’ of our long movement for equality. I was incredibly moved by the significance of this moment and by Mary’s remarkable expertise. I could not be more proud, both as GLAD’s Executive Director and as a member of the LGBT community, that she was the one to stand up and represent April and Jayne, Tim and Larry, and Dominique and Maurice – and all of us. Mary and the two other advocates in support of marriage equality, U.S. Solicitor General Donald Verrilli and Douglas Hallward-Driemeier, argued passionately for nearly an hour and a half, and handled the rapid-fire questions they were asked with finesse and eloquence. This was an historic day in a movement that has been decades in the making. We won’t likely know what the justices decide before the end of June. From now until then we’ll keep you updated with any news about these cases and other important work for LGBT equality. Mary’s closing words hit home and went right to the core of why this issue matters. Thank you for standing with us today, and every day. Together we have told the truth of our lives, and our love – and our quest for respect and dignity for our families cannot be denied.